Onions never looked better! Amazing! Love that shiny gold and silver look. VERY cool!!!!!!!! Congratulations on your sale!!! Congratulations on your new $ale David! I thought these were holiday ornaments! The silver and gold tones are amazing! Love your technique -- I've never seen anything like it. Nice close up. I love the toning. 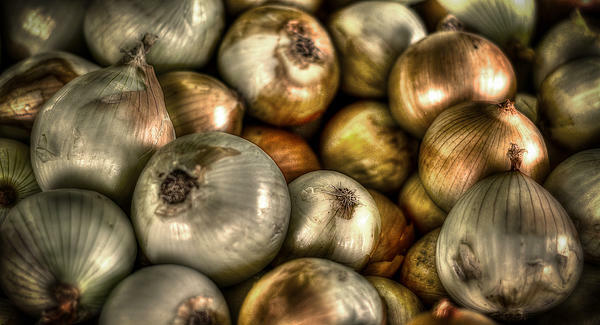 This is a great photograph of the onions. The lighting and the way you photographed them, has such a metallic look to them. It would look wonderful printed on metal or metallic paper. 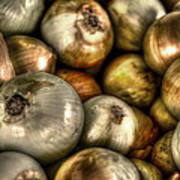 I don't know about you, but I just love onions. 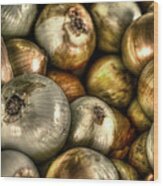 Whether they are in my salad or on my enchiladas, onions give a wonderful flavor that just adds some zing to food. 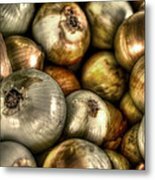 Of course, my favorite way to eat an onion is fried, whether it be onion rings or a Bloomin' Onion at the Outback Steakhouse, one thing is for sure... I do like my onions.